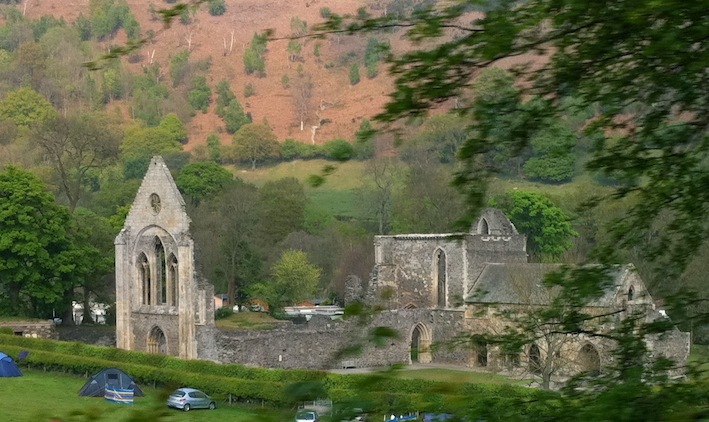 Valle Crucis Abbey in Wales is one of those hidden away serects, laying low in a valley which you came only see if you are driving up to the Horse Shoe Pass along from Llangollen. 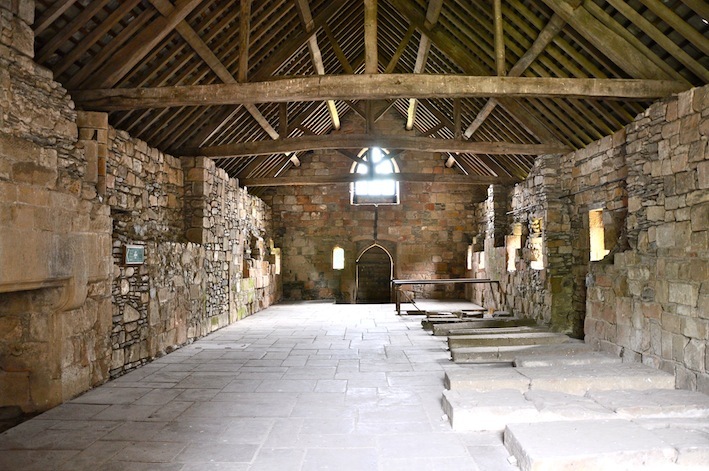 This is a beautiful site for an abbey and there are extensive remains, but this post is about the monks dormitory and the abbots lodgings. 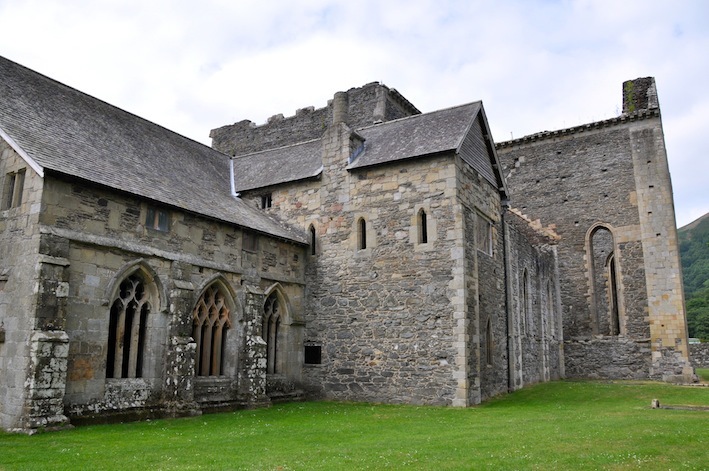 The abbey dates from 1201 and the dormitory is still roofed, I hasten to add not from that period, there are six west lancets windows for each one of the monk’s cubicles. 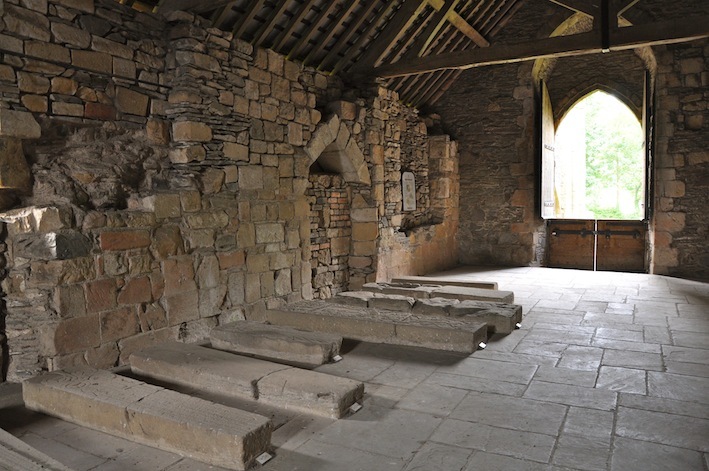 The dormitory now contains a fine set of twenty grave slabs removed from the church. 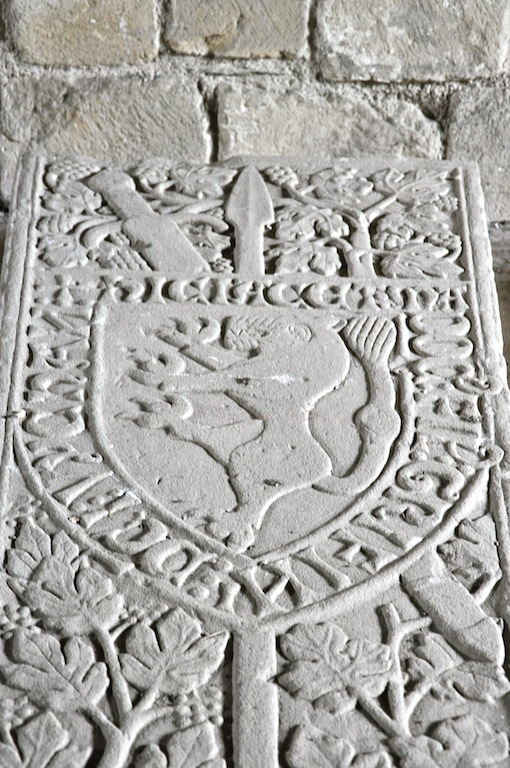 The above slab is an early 14th century half effigy. 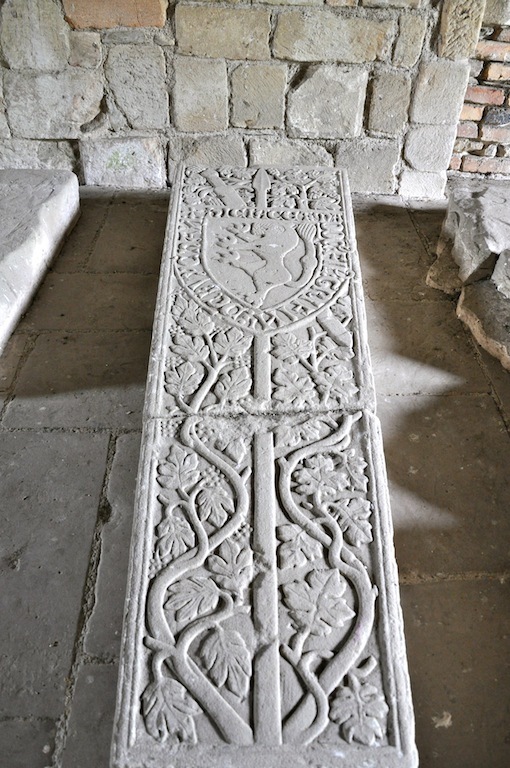 This is a rare dated grave slab of 1290 for Gweirca Owain. In the late 15th century there were new lodgings built for the abbot, you reach these by going through the dormitory. 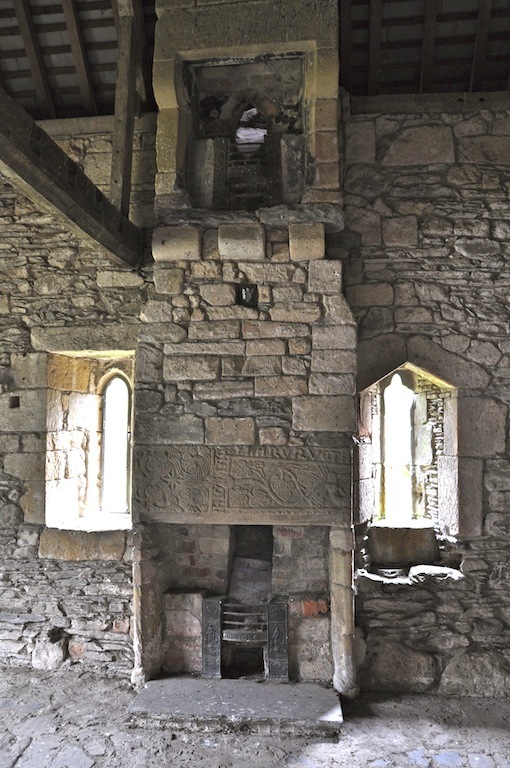 On reaching the first room of the lodgings, you notice above the fire place, a wonderful grave slab used as a lintel. I doubt if when carrying out the building of the lodgings in the 1400’s the builders used the grave slab, I think it happened when is was used as a farmhouse C1800 that the fire places were added. Looking above one fireplace you notice a second, there was another level at one time, long gone now. From the exterior of the building you can see the small lancet windows in the dormitory. The abbey as seen from the road, zoomed in quite a lot. The rest of the abbey will follow in another post. I can’t believe how many times I’ve driven that way and not gone to see it! It’s going on the list right now. We seem to be in a ‘carved stone’ mode at the moment – but contrast the quality of these with the more rustic Scottish examples. Can’t wait for Part 2. What a beautiful place, and I love the carvings. Somewhere else I would love to visit! I think I shall have to add a helicopter to my wish list too!! These carvings are amazing – with all those intricate swirls and loops, some of them look almost Pictish. Hello, This is another amazing and exciting post! I have been to Llangollen numerous times , walked , climbed up to the remains of the castle. seen the lovely” Ladies of Llangollen’s” house, Plas Newydd and viewed the abbey from a height but never knew there was so much to see below. 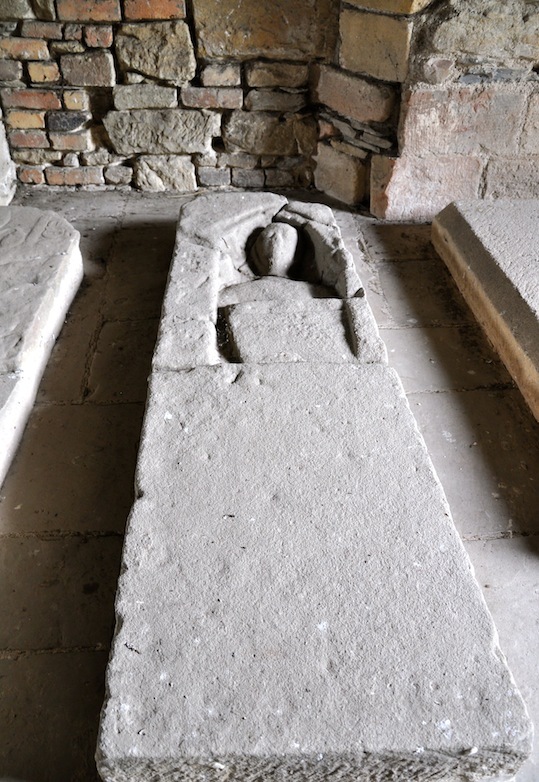 Did you know that the ‘ladies’ have a font from the abbey which is in their garden? In their diaries they tell when and how they came to buy it~ at one time their gardens were full of plantings of all kinds but after they died , and the house purchased by the next owner much was changed on the exterior as well as gardens~ thankfully not much changed in the interior though . I must go back now and see these wonderful treasures in the abbey~ What marvelously rich carvings ~ I always assumed that there was nothing left from the old abbey. Thank you again for sharing. You are very welcome~ think you would really enjoy both the gardens (lovely wild bit down in a steep sided valley(steps to descend!) with little stream flowing through the bottom.) as well eclectic magical house~ The story of the two ladies , Sarah Ponsoby and Lady Eleanor Butler is a fascinating one if you are not familiar with it~ They were quite a famous curiosity in their day and many famous people sought them out in their remote spot~ They never left the valley once they made their home there. Thanks again for such continuing interesting posts and photos.